It’s the end of February and I don’t know about you guys, but I consider the first of March to be the start of spring, no matter WHAT the weather is doing outside! So I ran out to our little beach because I love the water and the sunshine so much, I couldn’t wait another day! Truth released some new hair a few days ago, and two of the hairs come with headbands – one for Lovers and one for Haters. The headbands are detachable, so I’m wearing the Haters hair with the Lovers headband. Such a rebel, right? But both hairs are gorgeous! They’re somewhat similar, but the Lovers hair is a little sweeter and has bangs. [My sister is wearing it in her blog post, so you can see it there.] I liked the Haters hair a little more because I don’t always look great in bangs. I have a weird head! Enjoy the last day of February, everyone! There are a couple of things [among many, really] that I love in SL. One is having a house that is realistic enough, and two is… The Arcade!! 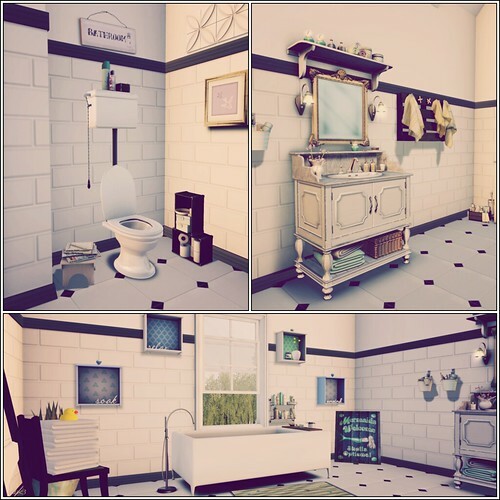 When Elle Kirshner of Second Spaces started showing sneak peeks of her Arcade set Bathroom Clutter, it spoke to every thing in my “Of COURSE I need a bathroom in SL!” heart of hearts. There are 11 items in the collection, and you will want every single one! Two are rare, and all of the items except for the Crates of Things are only one tiny little land impact! Elle is the queen of clutter as she’s proven time and time again. 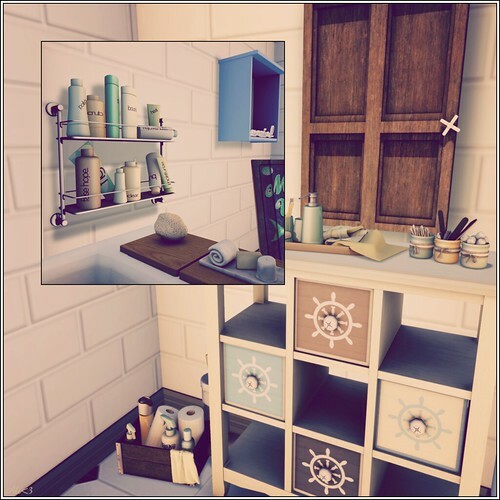 But really, it’s the cute little details that just MAKE a home, don’t you think? Here is the gacha guide for you with better, up close photos of the items. The Arcade starts on March 1st! You can see all of the awesome stuff on The Arcade Shopping Guide, too! Can’t nothing bring me down! I’m so happy today! Not for any particular reason, I’m just happy! Unfortunately, my RL weather is not cooperating with my mood so I threw on some bright colors and decided to stand in the SL sunshine! I had coffee this morning for the first time in about 3 months, so I’m kind of jittery and I need to go dance it out! Have a great hump day! Nothing particularly new to show you today, so we’re calling this my Throwback Thursday look. 🙂 I think sometimes it’s a great idea to dig into our old outfits and pull things out. We get so obsessed with having, and showing, the newest of the new that we forget our old stuff sometimes is perfect! But I’m a skating girl today because it’s my nephew Raven’s BirthRezday party tonight! Happy BirthRez Day, Raven! Can’t wait for your party!! The SLGBT Alliance has a great gacha event going on called Spread The Love! The designers participating are contributing 50% of all their proceeds to PFLAG, so come on down and play, do a good deed, and get some great stuff! And hey, you can spread the love yourself by giving things to friends, so really, it’s win win for all! Spread The Love is from now until February 28th. Lots of time to play! I’m combining three of my favorite things in this post today – Springtime, bunnies, and shoes! By the way! Fri.day is having a 50% off sale at the mainstore starting TOMORROW! From Wednesday until Sunday, all the treats for your feet [Shoes, socks, legwarmers] will be 50% off! This doesn’t include current event items or gacha items. L’accessoires is having a gacha event with the theme of Timeless Romance right now, and my cute Lovely Bunnies from Atelier Visconti are ready to be won there! You know you need bunnies in your life! Okay, I’ll admit it. I’ve never been a huge fan of any kind of “space” theme in SL. But some of the designers for Collabor88 this round have done such a great job, they just might be changing my mind! 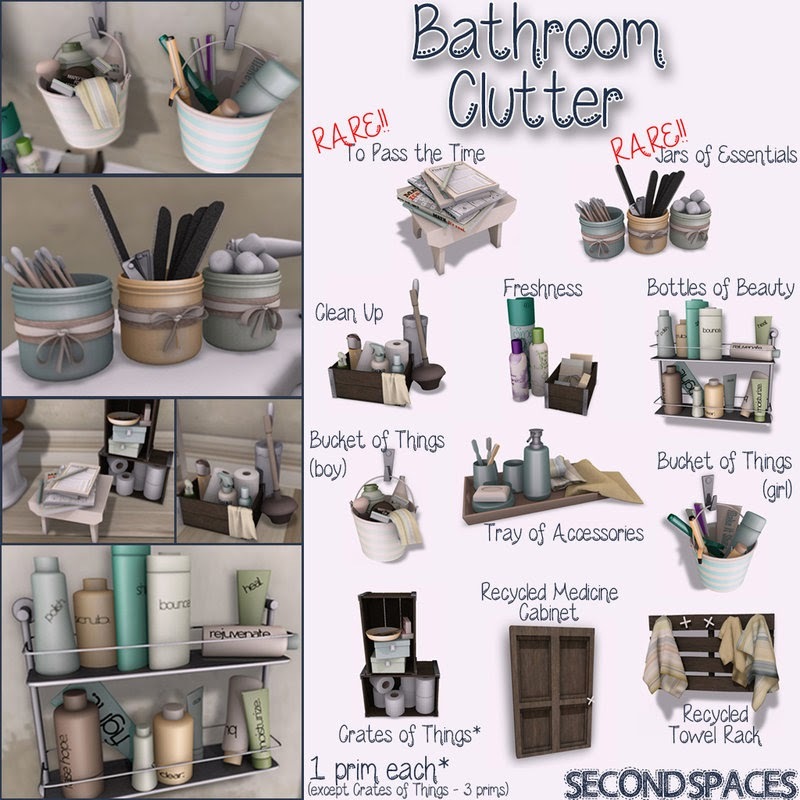 Second Spaces and MudHoney are two of my utmost favorite home decor and furniture stores in SL, so I was super happy to see them in this round. Second Spaces has items named Supernova and MudHoney has the Jerry office set. 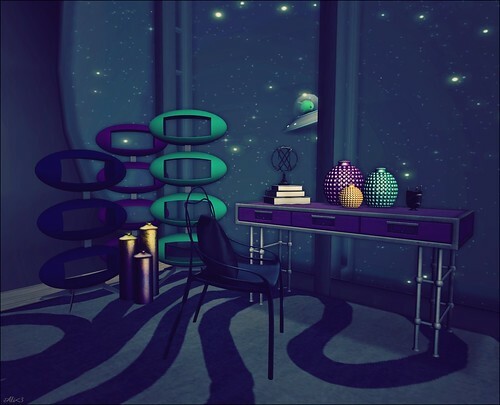 I used bits and pieces from both sets to create this “space study” in the very cool Centauri Pod skybox from Barnesworth Anubis, also at Collabor88. Head on over to Collabor88 to shop! I’m sure you’ll find a lot of things that are out of this world! Bringing Them To The Yard! Happy Friday, folks! Just a quickie post from me today to remind you all that Fifty Linden Friday is going on, and What Next is bringing all the boys [and girls!] to the yard with the new Milkshake Mixers! There are two sets, and each set comes with four mixers in different colors, plus some rezzable milkshake glass props. Heck of a deal for just $50L today, so hurry on over and get a shake! Don’t you love having reasons to smile? Luckily for me, my life gives me many many reasons to smile. That might be why I smile so much in my blog posts – It’s just natural! This week, a big reason to smile is that there is a new Coldlogic release! I’m super thrilled with the Sowers outfit! It’s a high cut skirt with a tucked in shirt and just as cute as can be! The best part is if you buy a couple [or all] of the colors, you can mix and match skirts and shirts. I’m wearing the shirt from red/white outfit, and the skirt from the sea/kiwi one. Love! I hope this week has brought you all many reasons to smile! Photo taken at Jasmine’s Hollow. They have a website, too! Consignment and !bang have teamed up for this round of The Mens Dept with Sweet Nothings. It’s two cute little hearts that have sayings on them along with a sweet pose. There are six sayings on the hearts that you can change via menu after clicking each heart. You can move yourself or your partner around with the heart, but if you want to move JUST the heart and not your whole body, click on “Edit Linked Parts” in your build menu and it’ll work just fine. I did that here to fit our hands a little better. The Mens Dept is open now, so go shop!